In case you don’t own a fax machine, and hate the hassle of crampy fax machines, FaxZero may be a helpful service you are looking for. Being among the several electronic faxing options, it is an easy way to send a fax via the Internet and a browser in place of a phone line and a machine. This service is free and inexpensive considering your requirement. This is a cost effective and quick solution for your faxing requirement. All you have to do is copy and paste your text or if you wish you can attach up to 3 different files. It also provides support to various file types. In case you encounter a wrong fax number, disconnected machine or a busy line, then you don’t have to lose your money. It is an easy and convenient fax service. Considering its pricing, for less than 3 pages, this service is free. To send over 4 to 25 pages within US and Canada, you have to pay $1.99 and International faxes of up to 15 pages to most countries at a mere $3.63. With its simple and intuitive interface, its easier to submit faxes. There are no complicated options. You just have to enter the basic information, attach the document you wish to send and click on send. At $1.99 for 25 pages, this is quite a good deal. It supports various file formats like.DOC,.DOCX, TXT, PDF, RTF, JPG, GIF, PNG, HTML, TIFF, PPT and XLS/XLSX. Once you send a fax and confirm the email, you will receive a link to check the progress of your fax. The faxes that are received are legible and crisp. Its automated process repeats the multiple attempts to send a fax 5 times before giving up. Once you have sent a fax successfully, you will receive an email or that it failed after 5 repeated attempts. To use this free service, you have to include a cover sheet for each fax. This first page includes the information of sender and recipients and also have a branded logo for FaxZero. In case you are looking for professional fax delivery, you may not like this. One thing that bothered us is that when you hit “Send Free Fax Now”, the fax is not sent. You need to check your email and then click on the link inside to confirm your request for sending the fax. This is a fax-sending and not a receiving service. You can’t receive any fax using it. One has to make sure to inform the recipient that they can’t send back any reply or fax back to the sender. There is no mobile app, and you have to use the mobile’s browser. There is file size limit of 20 MB for your fax. That may result in unavailability to send high-resolution PDFs. Another negative feature is that you can send only 5 faxes in a day using the free service. 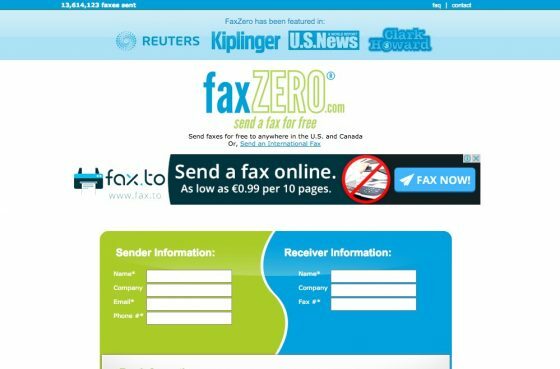 FaxZero is a good option in case you encounter an emergency situation to send a fax. But in case you wish to receive any fax, this service ain’t for you. If you use fax for few faxes a day, then you can go for this online fax service. If these issues are acceptable to you, then you can go ahead and test this service. Don’t forget to mention your experience and views on the comment section below.